dsjv :: Deep South Jewish Voice: Analysis :: Beset By Scandals And War Fallout, Can Ehud Olmert Stay In Power? Analysis :: Beset By Scandals And War Fallout, Can Ehud Olmert Stay In Power? 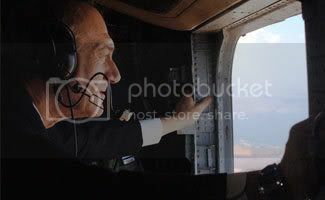 Israeli Prime Minister Ehud Olmert flies over northern Israel by helicopter during this summer´s war in Lebanon. JERUSALEM, Jan. 22 (JTA) — Following the sudden but not unexpected resignation of the Israeli army’s chief of staff, pundits are asking how much longer Ehud Olmert, the country’s beleaguered prime minister, can survive in office. Under investigation for corruption and with his approval ratings at an all-time low, Olmert is facing increasing public pressure to quit. Things could get even worse for him if the Winograd Commission, which is investigating last summer’s war with Hezbollah in Lebanon, is critical of his role when it presents preliminary findings at the end of the month. But Olmert is a tough customer unlikely to resign of his own accord. And the way the Israeli system works, it could be difficult to force him out. The fact that Lt. Gen Dan Halutz chose to resign clearly marks last summer’s war in Lebanon as a failure. And the fact that he has already gone puts the Winograd spotlight on those up the line — Defense Minister Amir Peretz and Olmert himself. The Winograd mandate includes asking the big questions: Why did the prime minister decide to go to war so hastily, just hours after the ostensible casus belli, the abduction of two Israeli soldiers by Hezbollah along the border with Lebanon? Why didn’t Olmert pressure the army to launch a major ground strike much earlier in the campaign to stop rocket fire on Israeli civilians? And why didn’t the government do more to move civilians out of the line of fire? According to Yoel Marcus, the doyen of Israeli political analysts, the perceived failure in the war, the corruption clouds and the absence of clear leadership on peacemaking with the Palestinians or the Syrians has spawned a dark public mood that the Olmert administration will not survive. Although nothing has been proven against Olmert, the accumulation of corruption scandals involving him or close members of his administration has eroded public confidence in the prime minister. Olmert is being investigated on suspicion of rigging a tender for the sale of Bank Leumi, Israel’s second largest bank, when he was finance minister in 2005-06. Olmert says the changes he made were to maximize state profits from the sale. The prosecution has ordered the police to investigate whether the changes were meant to help his billionaire friends, American S. Daniel Abraham and Australian Frank Lowy — although in the end they did not make a bid. Olmert also is suspected of giving preference at the Investment Center to clients of a former law partner and of making dozens of political appointments in the Small Business Center when he was minister of industry and trade in 2003-05. He also has been tainted by suspicions of corruption by association: His close friend, Finance Minister Avraham Hirschson, is suspected of involvement in a sick-fund scam, and his longtime secretary, Shula Zaken, is suspected of helping to appoint cronies to the National Tax Authority in return for tax reductions for pals. Even if Olmert is innocent, critics say he won’t be able to govern because he’ll be too busy trying to clear his name. Olmert also is under fire for a perceived lack of political leadership. He says he doesn’t have the political power to make major diplomatic moves, but critics say he doesn’t seem to have an agenda for peacemaking with the Palestinians or the Syrians, or any unilateral alternative either. The resulting loss of public confidence in the prime minister is reflected in recent public opinion polls. A mid-January survey in Ha’aretz gave Olmert an approval rating nationwide of just 14 percent. A few days later the news for the prime minister was even worse: A poll aired on Israel’s Channel 10 TV claimed that 69 percent of Israelis actually wanted Olmert to resign. Ironically, although Olmert is probably the most unpopular prime minister in Israeli history, he has one of the strongest coalitions based on the support of 78 of the 120 Knesset members. So how could he be forced out of office? One way would be for a majority of 61 Knesset members to vote for early elections. But since many of them are unlikely to be re-elected, pundits reckon the chances of that happening any time soon are remote. A more likely move is a vote of “constructive no-confidence” in which 61 Knesset members coalesce around an alternative candidate for prime minister, thereby installing a new national leader without holding new national elections. Here pundits see two possibilities — a split in Olmert’s Kadima Party in which half the Kadima legislators return to their Likud origins or at least make a pact with Likud, bringing its leader Benjamin Netanyahu to power. The second constructive no-confidence scenario involves Foreign Minister Tzipi Livni and a coup in Kadima in which she replaces Olmert as leader. Polls show Livni with a 51 percent approval rating to Olmert’s 14 percent, and see her as three times more likely than Olmert to win a new election. Another scenario that could bring down Olmert would be Labor leaving the coalition, but that’s unlikely to happen before Labor elects a new leader in May. If Labor does pull out then, it would leave the Likud in a position to decide whether to join Olmert in Labor’s place or to force new elections. Most pundits agree that the countdown on Olmert’s government has begun, but they differ on how long it will take before it falls. And despite his obvious weakness, most pundits think Olmert will be able to stumble on for some time yet. But where Olmert’s predecessor, Ariel Sharon, was able to ride out a rebellion in the Likud and a string of corruption scandals, most pundits believe that even if he gets by the Winograd Commission, Olmert does not have the political clout in the longer term to emulate his illustrious predecessor.